Amber Interior Design: Just Some Things.. I'm pretty sure that if I was granted a magical closet made up entirely of your fashion posts + Jamie Meares' Closet Cravings posts, I'd die a happy woman. Love! Been pining away for that Claire Vivier clutch for months now. I really need to just breakdown. Love the sweatshirt and moccassins! Super cute. This is so cute! Have you ever thought about doinginterior design in Calgary.? You could actually make pretty decent money, and you obviously have a knack for matching patterns and designing! thanks for this blog! I have been in need of some great ideas from interior decorators for a long time. Love what you're doing here. 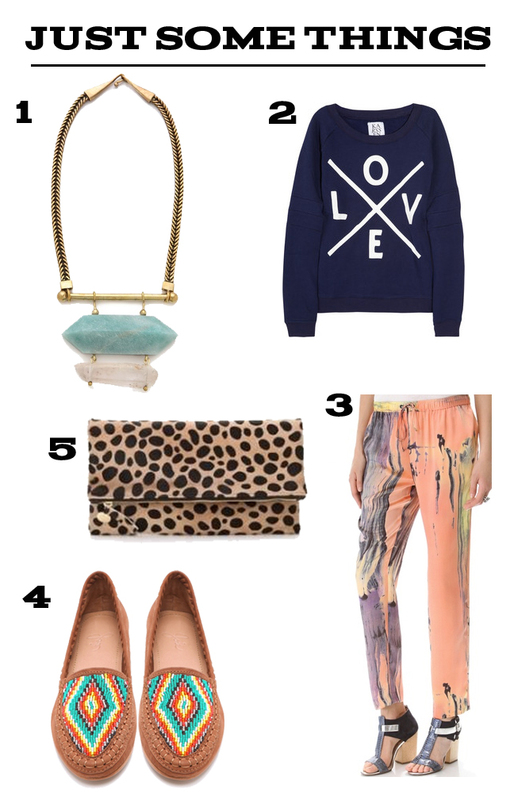 These pants are great (the tie die ones) - Love the water color look - and need spring to happen! Needed to post you one tiny note to be able to thank you so much over again for all the remarkable suggestions you have discussed in this article. This has been so incredibly generous of people like you giving unhampered just what most of us might have marketed for an ebook to earn some money on their own, particularly observing that you could have attempted it in the event you desired. Those recommendations again performed to turn into simple way to fully grasp that some people have a comparable desire the same as mine to recognize more and more with regard to this issue. I’m sure there are various more pleasant occasions ahead for those who examine your blog. I love to see the post.specially the shoes are amazing and it seems to be comfort for the people who are using..i wish that if that would be in more colors it gives overlook.. The necklace and sweat shirt are a hit in my book. I love them so much. The shoes are a little different but not too bad. The pants look like paint was splattered on them. Thank you for posting. I like all the patterns and they are also cool if they can be used in interior design. I am a thirty year old single guy that knows nothing of home decor and design. I am tired of my home looking like an unorganized dorm room. Is it possible to hire an interior decorating company to do their magic on my home? Pilihan terbaik untuk liburan dan untuk santai di rumah. this website is really amazing on posting. Thank you for this article.Nice photos too. Nice collections, keep on go. Lovely posted shared. If anyone looking for interior designer in nagpur then contact IIDT. Thanks for sharing. If someone want to know more about Interior design I think this is the right place for you! It's a good idea to showcase a new upcomming products in the market. Thanks for sharing with us. Nice post. Thanks for sharing usable information. I liked that shoes so much and some other fashion things too.. where can i buy them. Wow.. I like your fashion style. BTW if you know, Studio Seven Dubai basically a furniture manufacturing website, they have best Architecture team, they always create unique and master piece for our art galleries and art exhibition.